@javits.javits: Practically speaking, how do you regulate pay when it's salary based? Every salary is negotiated individually and every situation is unique. That makes it very difficult to prove an employer is unfairly paying one worker less than another regardless of gender. Deciding to negotiate every salary individually is an employer policy choice, and I would say not the best one. Wouldn't it be better to have salary scales that are informed by some sort of more rational & objective judgements about the market for particular positions & policies for reviewing salaries regularly to ensure that unjustified disparities haven't crept into your pay practices? If an employer is relying on a process -- negotiation -- that systematically and predictably leads to men being paid more, why is it inappropriate to hold an employer responsible for remedying the gender wage gap that results? @wholistic.thinker: I don't understand why negotiating a salary is bad. I'm a man and if I think I'm worth more than they are offering I'd tell them. Why can't a woman do this? Wouldn't the company stand out if they kept rejecting women of equal skills? Women can negotiate and lots do. But social science shows us that employers react differently to women negotiating and men negotiating. Women are much more likely to be judged harshly for asking for more. It isn't necessarily the case that you have nothing to lose by asking, and women's differences in negotiating behavior seems in part to be very reasonable responses based on how women are comparatively more likely to be penalized for negotiating (and not being “nice"). @jr.hebert: Are there any specific federal policy proposals you are advocating for in Congress? The Paycheck Fairness Act is a good first step in strengthening equal pay law & equal pay enforcement. Raising the minimum wage and applying the same min wage to tipped workers would also help close the wage gap because women would disproportionately benefit. The Family Act, the Healthy Families Act, the Schedules That Work Act and increased investment in child care would make it less likely that women have to take time out of the workforce when they become parents, which would also help close the wage gap. @jr.hebert: What do you say to folks who are concerned that the Paycheck Fairness Act exposes employers to frivolous lawsuits and litigation that could restrict merit-based pay? The Paycheck Fairness Act wouldn't change the provision of the Equal Pay Act that allows employers to defeat a claim if they can show a disparity based on a merit system. It would just require any rationale for a pay disparity be based on a business need, related to the job at issue. @cameronpig: Slightly off topic from equal pay- many say women are not involved in industries such as tech because of various reasons: my favorite is always they simply are not "wired for it." How can we combat this? I've heard of integrating women from an early age with similar toys as boys, would this help? As the mother of an 8-year-old daughter, that is a question I think about a lot. I do think it is important to give girls opportunities to explore and feel confident in STEM subjects and to present these as things that are as appealing as toys centered on imaginative play and the like. I have slowly come to appreciate toys like Lego Friends -- Legos for girls, which initially I was very hostile to -- because of the inroads they can make in girls' imaginations, encouraging more construction & 3D design play, for example. @vp.vip: The needs of everyone as an individual is different. So how do we get equal when everyone really just different? While I agree that people with same skill set should be paid the same regardless of gender. But it seems like a cultural change rather than legislative? Cultural change is important, but policy change helps drive culture. For example, the EEOC is proposing to require large employers to start reporting wage data along with demographic data for their workforces. This is likely to change how employers address these issues somewhat because the act of collecting that data will force employers to engage with wage gaps in their workforce in a way they haven't before, which will lead more to explore how best to change the workforce to prevent these gaps. @locke.bell: I know many women working on Capitol Hill who are paid far less than their male counterparts. They face more harassment and discrimination day to day as well, but there is no recourse here. The same laws don't apply to Congress, and complaining is a sure fire way to be blacklisted. Thoughts? While the enforcement mechanisms are different, the anti discrimination laws to apply to Congress. Frankly women facing discrimination always have to think through the hard questions about the likelihood of retaliation (also illegal, but obviously still happens) if they complain. But there are absolutely legal protections against pay discrimination, harassment, etc., for staffers. @saintly: Thanks for being here Emily; what do you recommend for young women who know they are getting paid less than their male counterparts? Bring it up with HR or your supervisor. Express your concerns, make the case for why you feel you should be paid the same. I think that is the right first step. @girl.from.here: Our offices don't have HR, and in my experience, our supervisors are often the "old boys" who are themselves discriminatory. If we want the experience, we must to accept the pay gap and harassment. @saintly: There is no safe space to address these issues. Makes it hard when this is the first job I've had that actually pays... Always thought there'd be a safe wait to bring this up but I've see other women get forced out of the office if they were being perceived as “difficult”. In my office my direct supervisor and my chief are women; whenever I bring up fairness/benefit/pay concerns I'm pressured to work harder for my Member and reminded what an honor it is just to be here. It's implied that I'm being judged for even questioning my pay. Raise it with the person who sets your salary -- and if there are other women (or men!) in your office that share your concerns, consider asking for a meeting together. It is often easier to talk about when you are not the only one raising the concern. Also think about whether there is a more senior woman in your office who you could discuss this with, who might coach you through the politics and help make your case. @saintly: My office is small, the senior women are biased towards the men in my office and are not helpful at all. It’s never even been clear to me who set my salary. I know it may sound to some like I'm making excuses, but there are some very isolated staffers here.... I'm a college educated single white woman and if I'm having trouble, what does that bode for other women? @girl.from.here: I'm with @saintly here. We are very isolated in the hill, each office is run like a small business, and there is very little room for voicing your concerns. I'm sure this isn't so different from millions of women working in small business across the country though. @lowrie.dewolf: @saintly unfortunately women tend to be non supportive of other/younger women in the workplace. I experienced a similar "you're just lucky to have a job" response in my last office from a female supervisor. It's a cultural problem we must strive to change. I think you are all making very good points about how difficult it is for individuals to challenge pay discrimination. These are real obstacles. From a big picture perspective it is one reason why it is so important to empower agencies like DOL & EEOC as enforcers -- and to incentivize employers to self-audit & self-correct because women can't do it on their own. But in individual cases sometimes there is no risk free path forward, for sure. Consider creating safe spaces for women staffers to talk to each other from different offices, maybe through the Cloakroom tool, as having a forum to strategize together and share experiences can be very valuable. Thank you for letting me participate today. I appreciate the opportunity to speak with you all. @lowrie.dewolf: I really appreciate your point about policy change driving cultural change. I sure hope you are right! Thank you for your insight today. @saintly: Thank you for your time @emily.martin! @wholistic.thinker: Thanks for the insight! 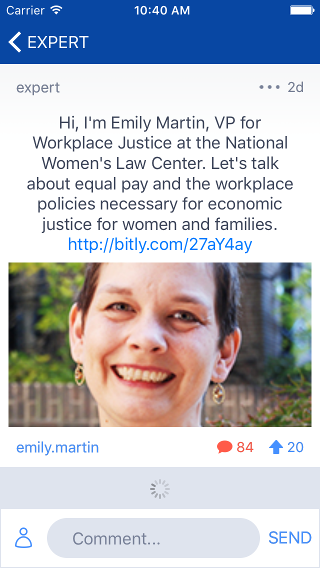 @saintly: Thanks @emily.martin.These are the issues that brought me here to begin with!